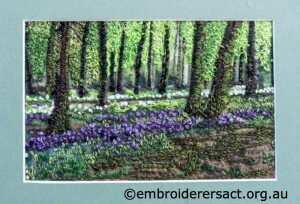 Today we’re going to share a landscape that Pat Bootland stitched on Solvy water soluble backing. 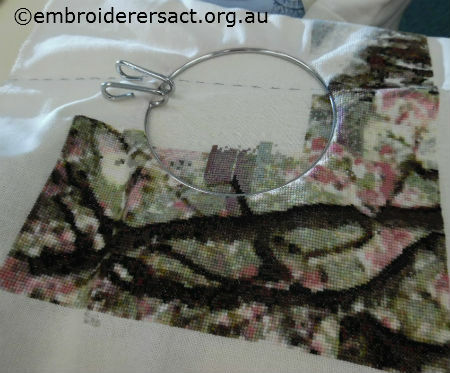 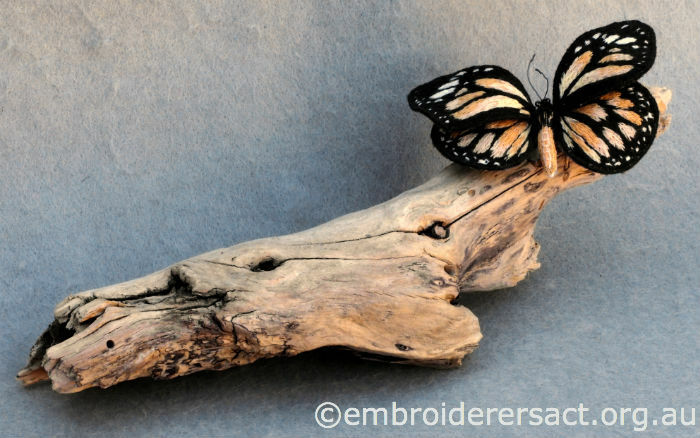 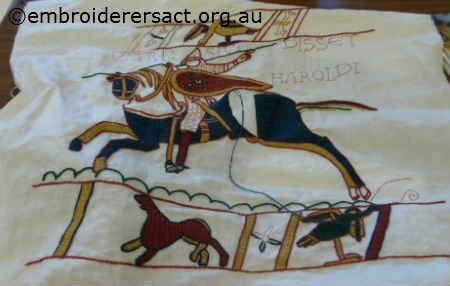 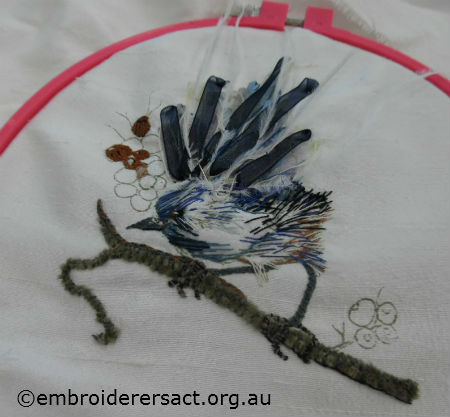 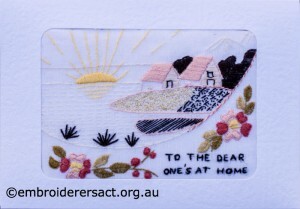 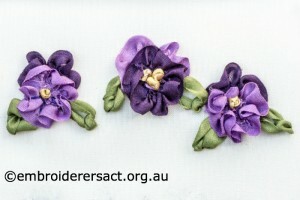 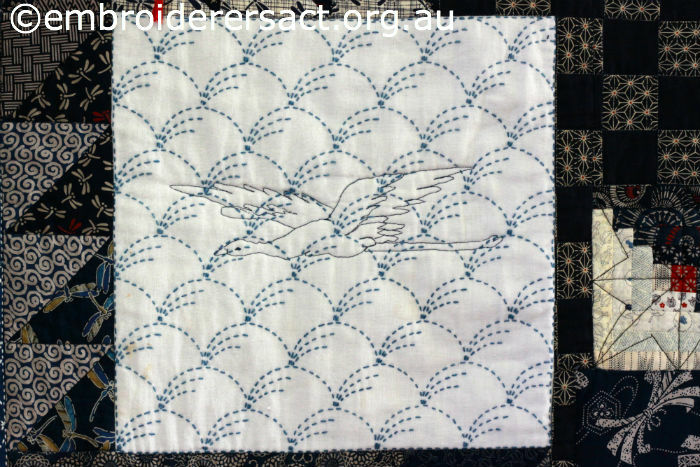 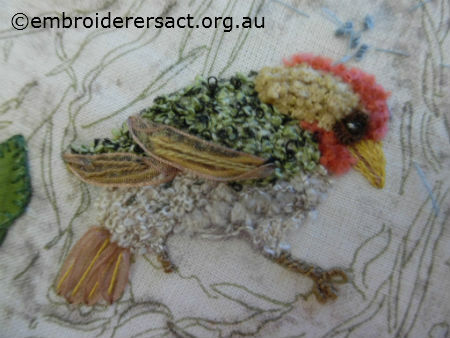 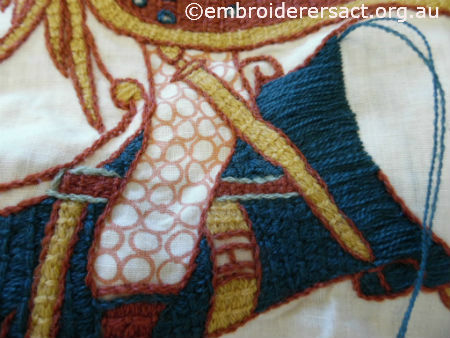 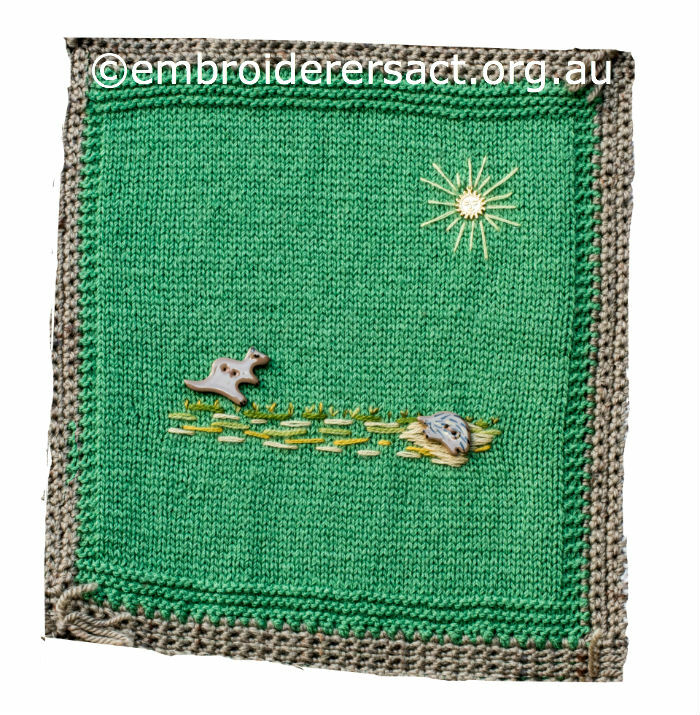 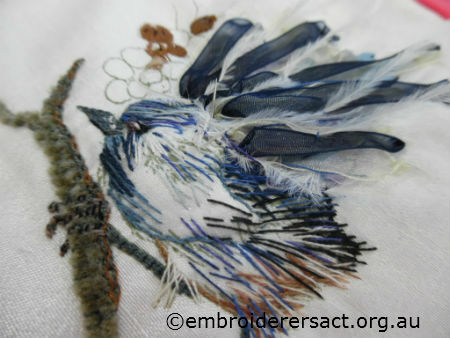 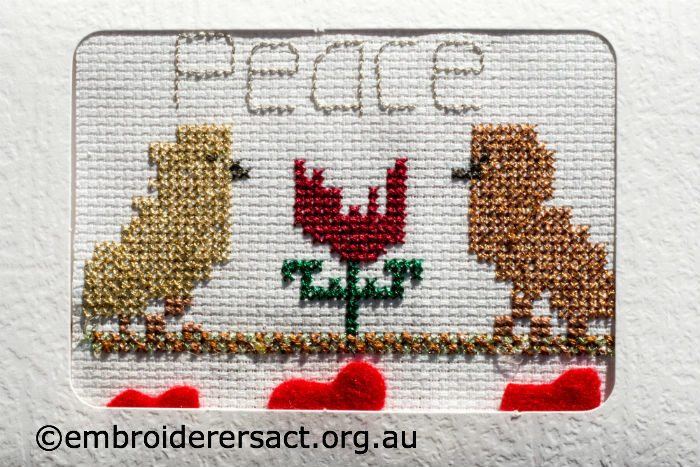 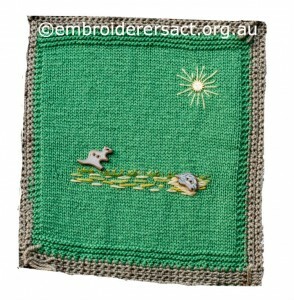 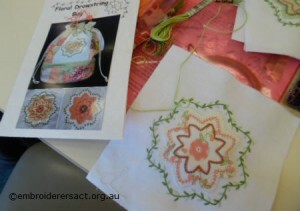 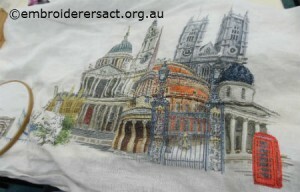 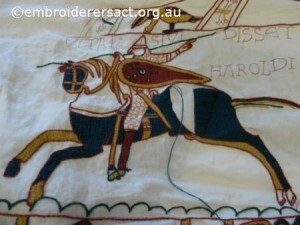 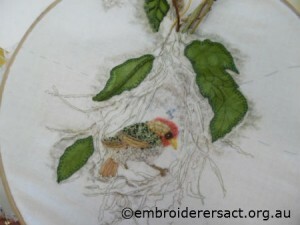 This is the so cool embroidery that emerged when she dissolved the Solvy. 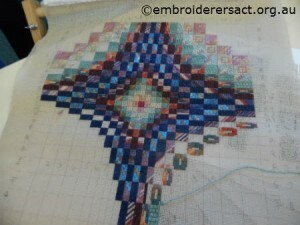 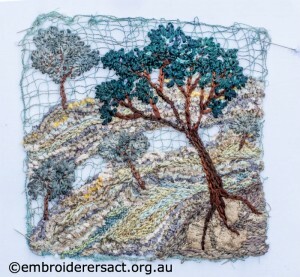 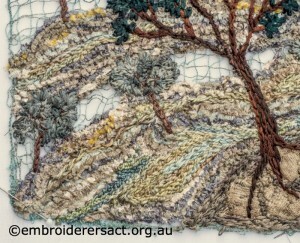 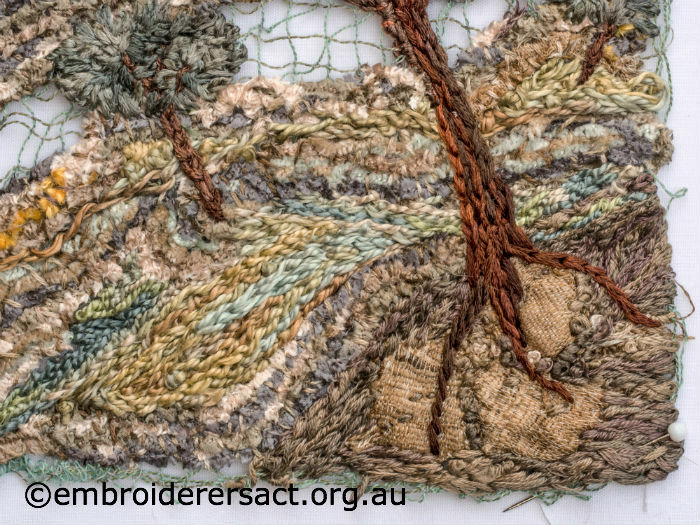 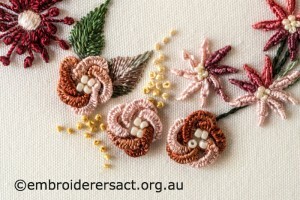 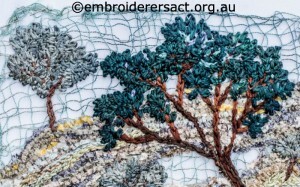 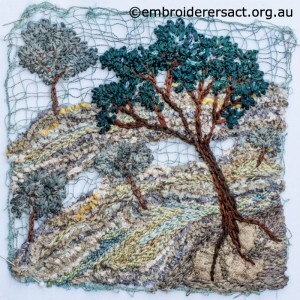 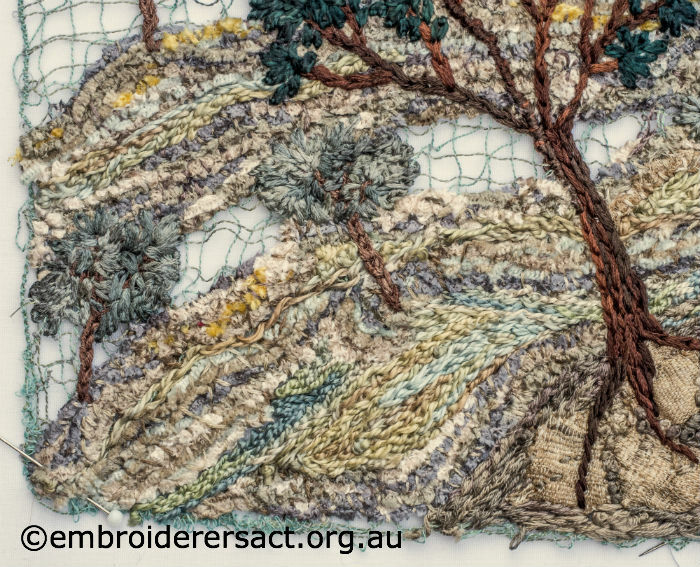 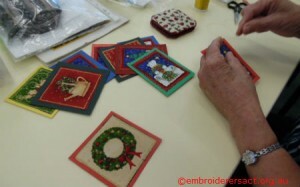 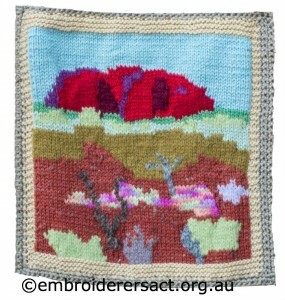 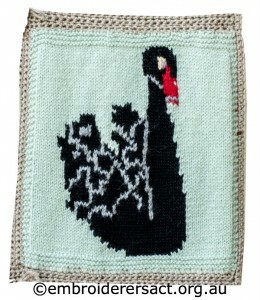 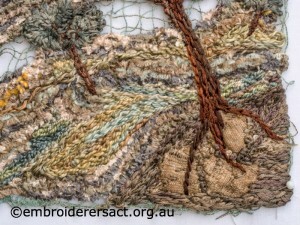 I love to watch Pat as she works on these dense, free form areas of stitch such as the tree canopy and the undergrowth. 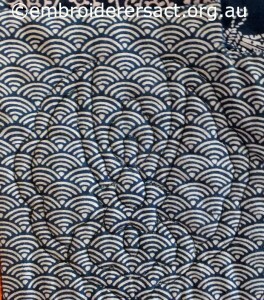 It’s random purposefulness! 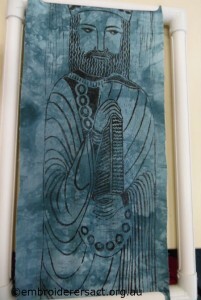 In this post we’re going to share a rug made by one of the delightful members of our guild Glenda Hudson. 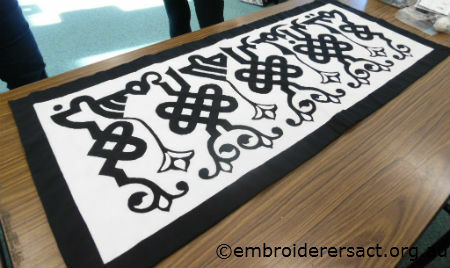 It has a really cool story. 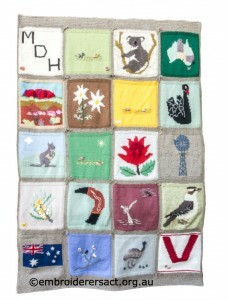 Glenda made this rug for her son Matthew and it’s a combination of knitting and embroidery. 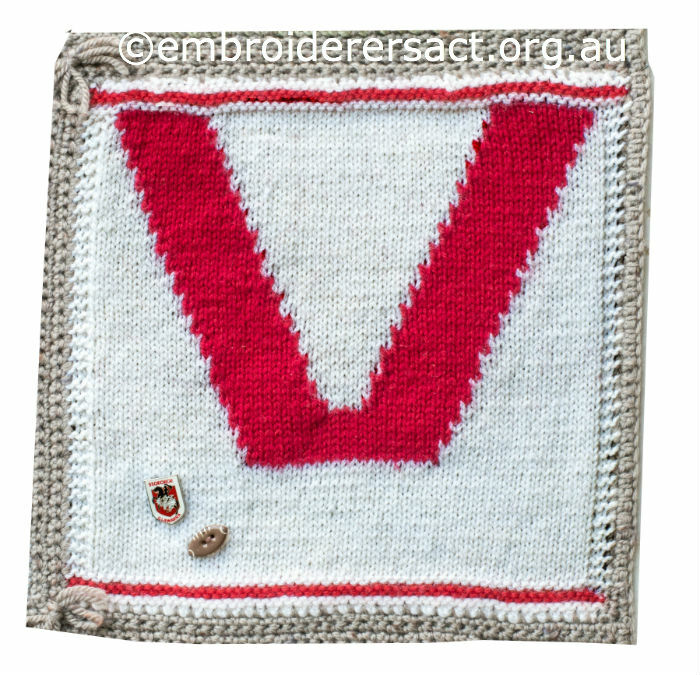 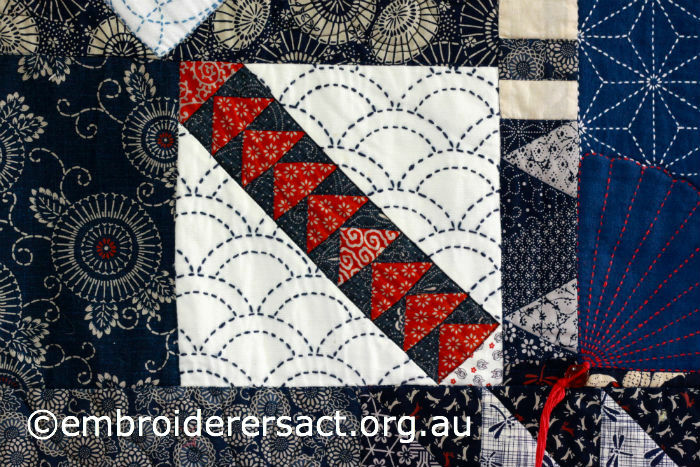 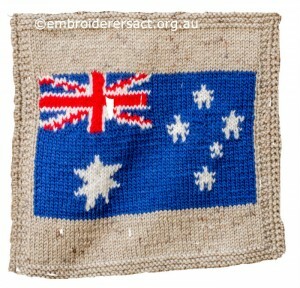 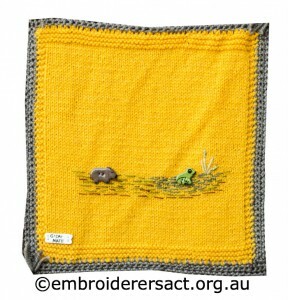 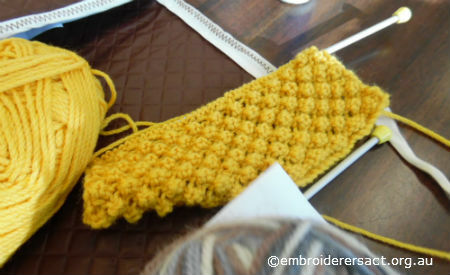 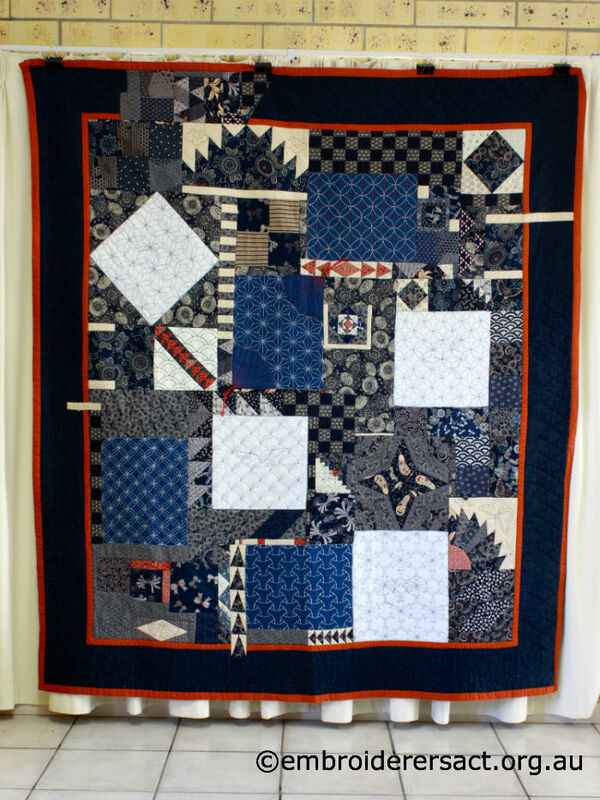 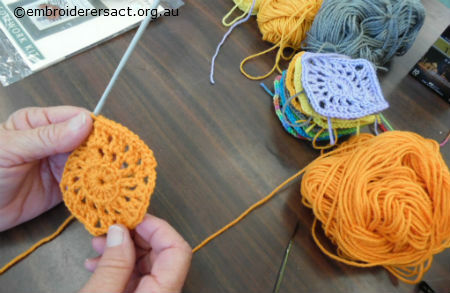 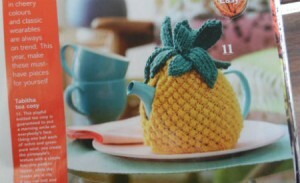 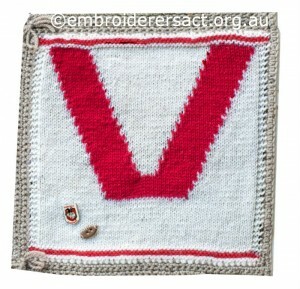 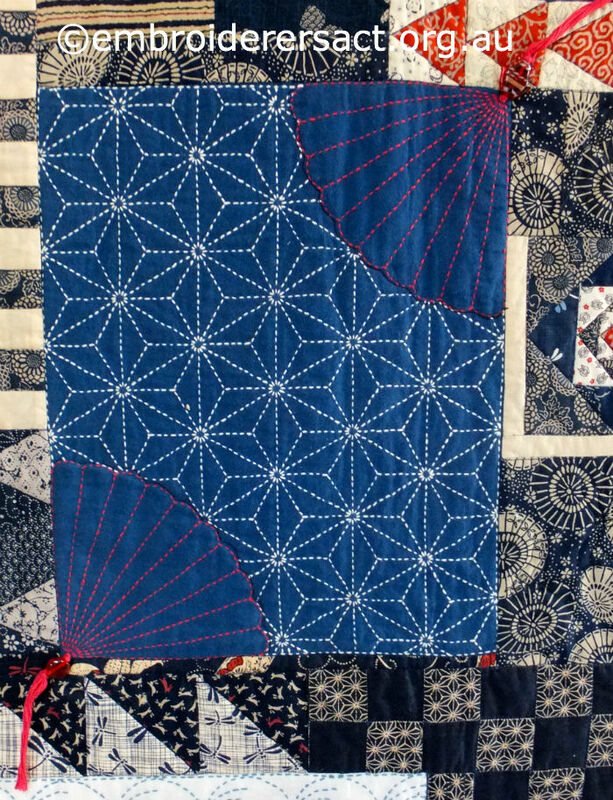 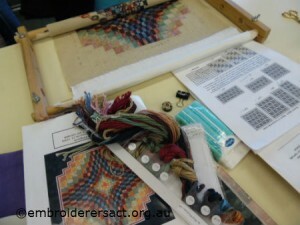 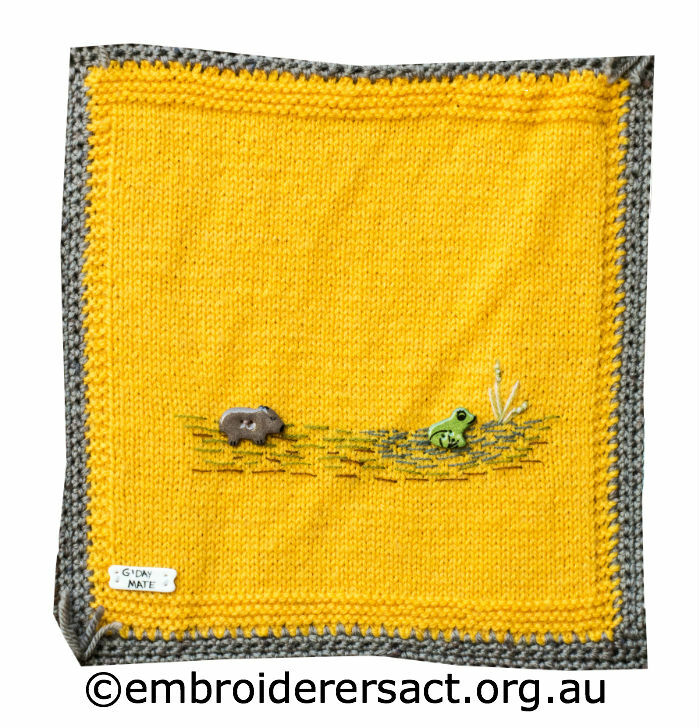 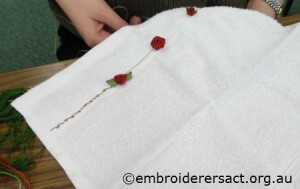 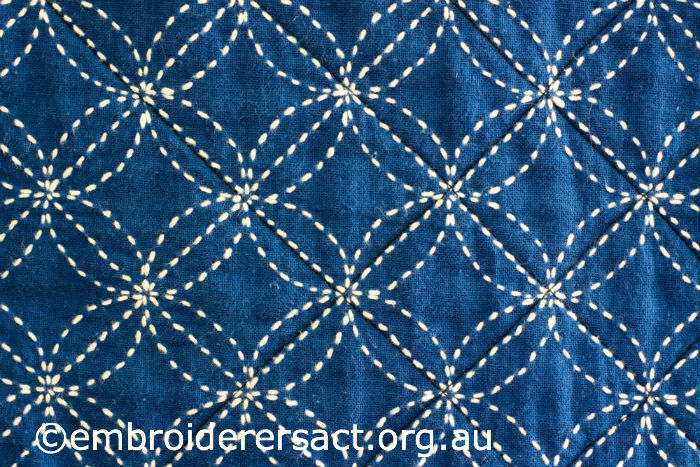 The squares are joined by crochet while the backing is joined with a blanket stitch edging and held with ties. 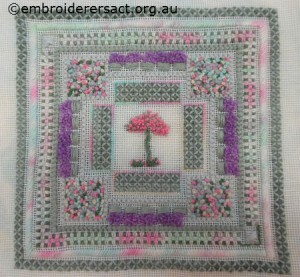 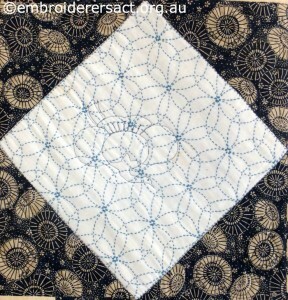 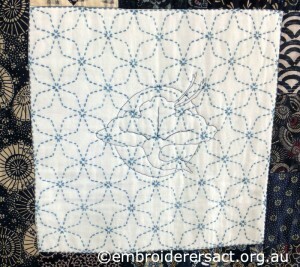 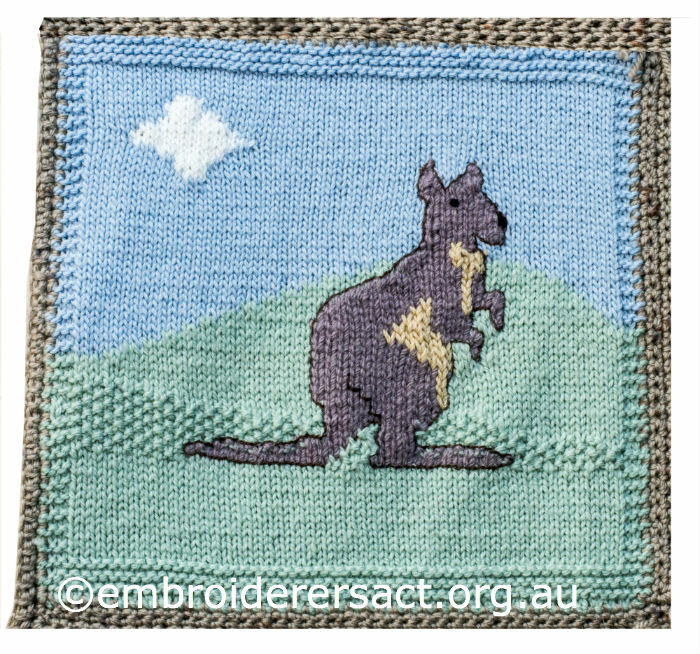 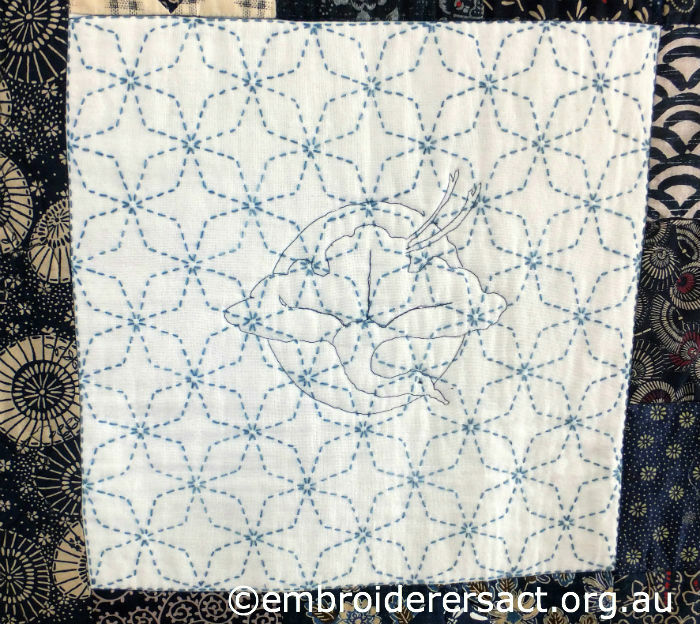 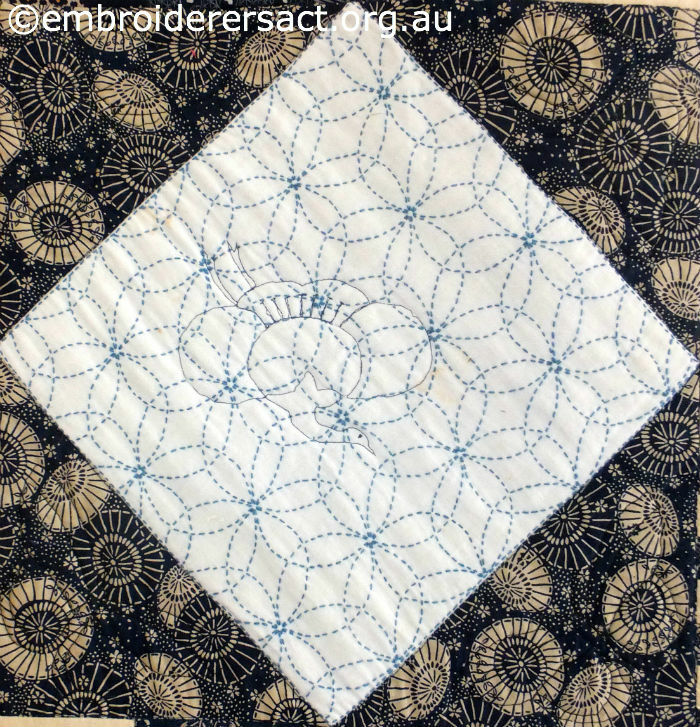 Some of the squares come from a pattern book put out by the Ku-ring-gai branch of the Knitters Guild NSW and the too cute buttons from Nikki Tervo Designs. 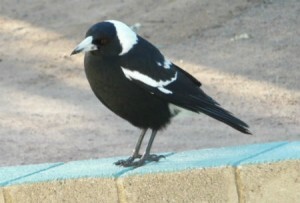 My son Matthew has a great love of the Australian bush and its flora, fauna & birdlife. 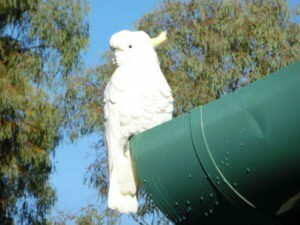 He works for Parks Australia as an environmental scientist. 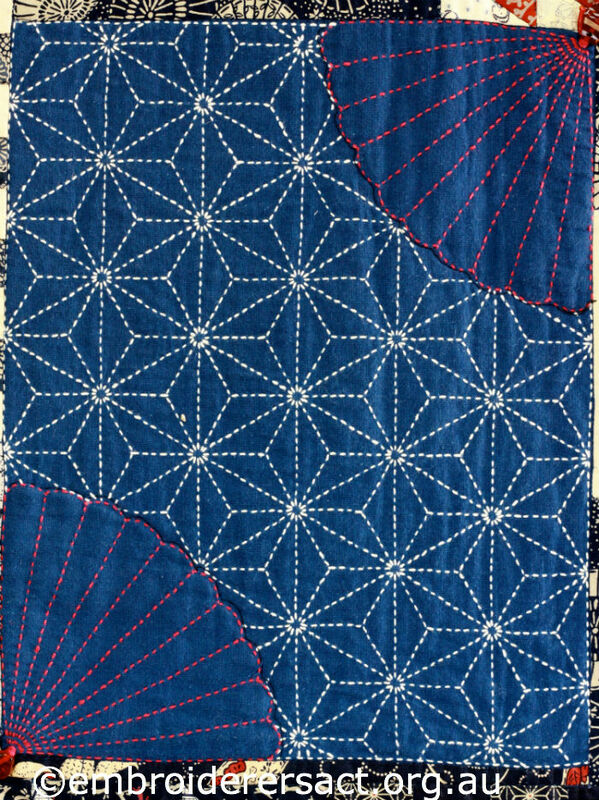 I made this rug to represent various aspects of his life. and here are the individual blocks. This first block show Matthew’s love of his pets and cricket. 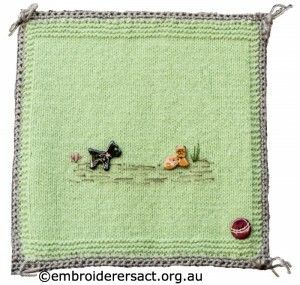 His dog Cherie was a very good fielder of the ball. 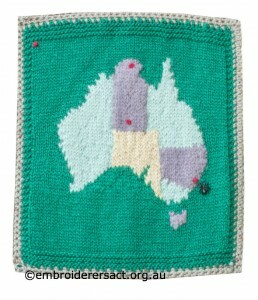 and this map of Australia shows the parks that he’s worked in. 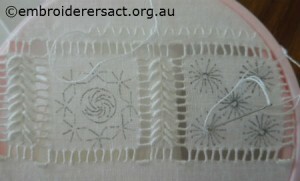 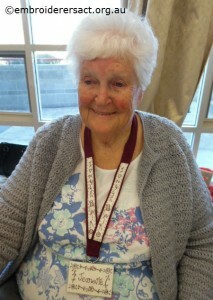 Glenda’s included a funnel web spider because her son had a close encounter with one. 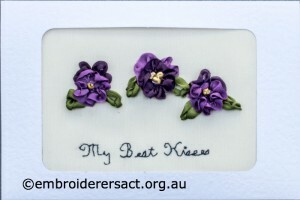 Isn’t it wonderful – it just makes me smile! 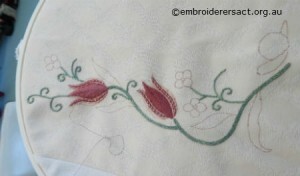 I hope you’re having a relaxing weekend and finding time to do some stitching. 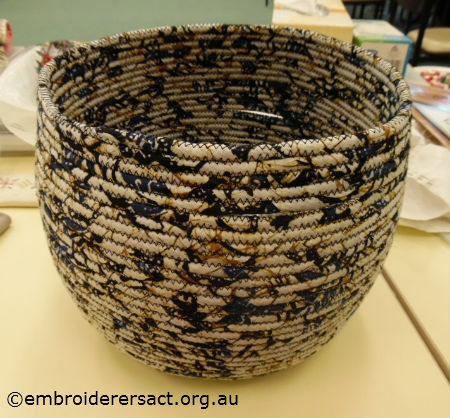 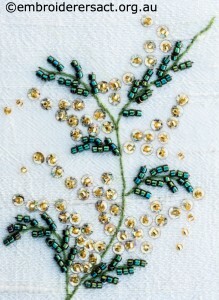 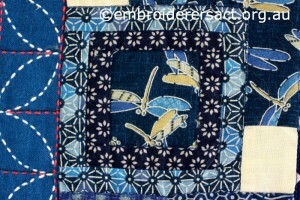 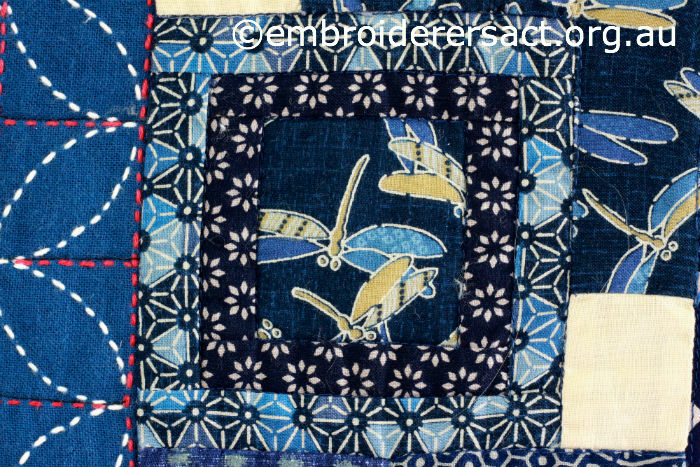 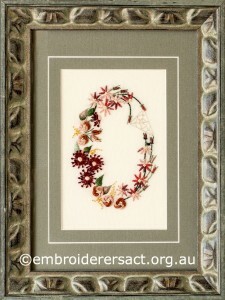 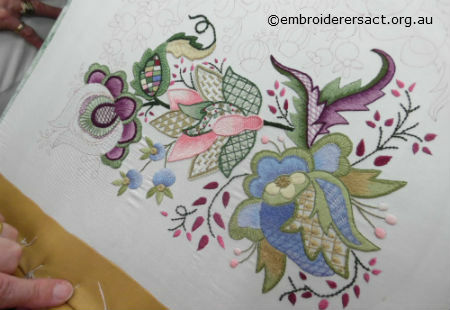 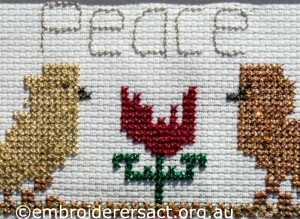 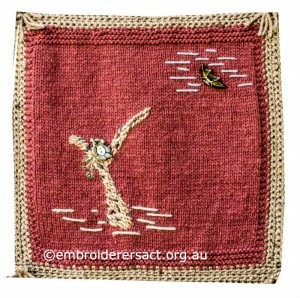 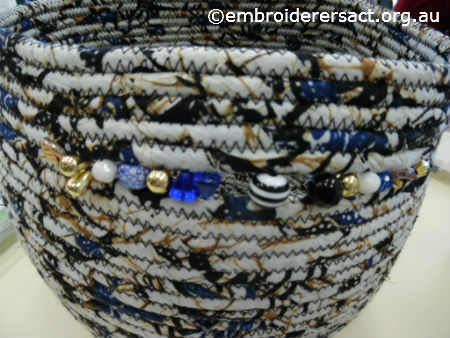 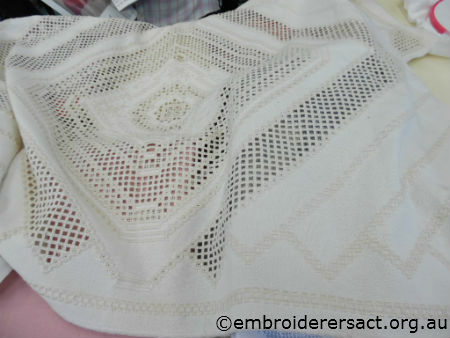 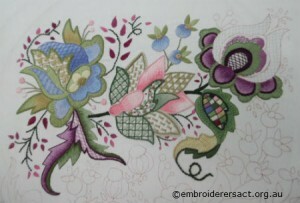 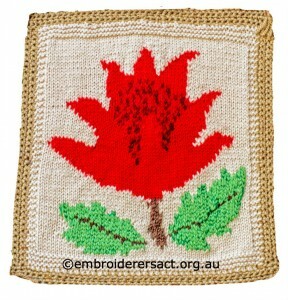 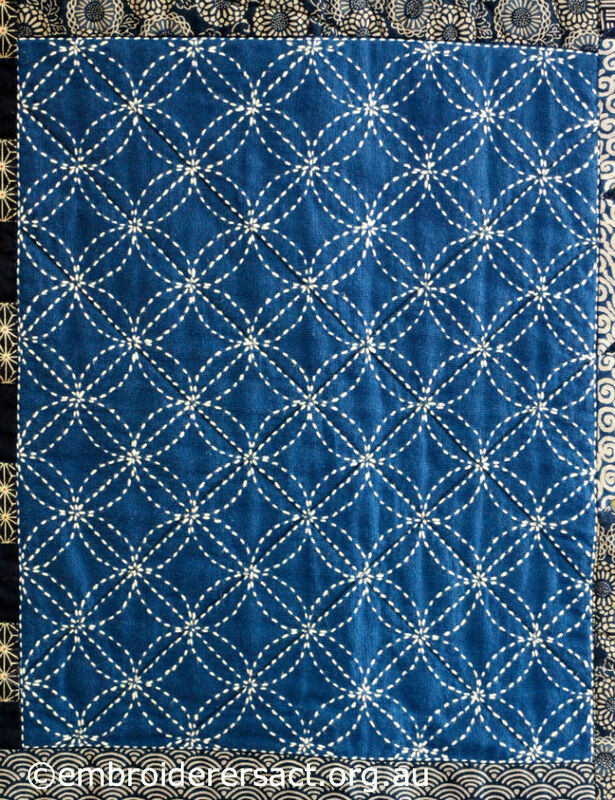 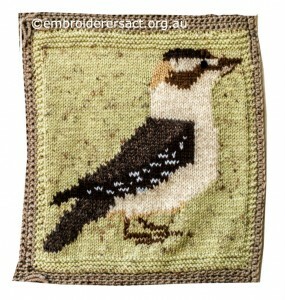 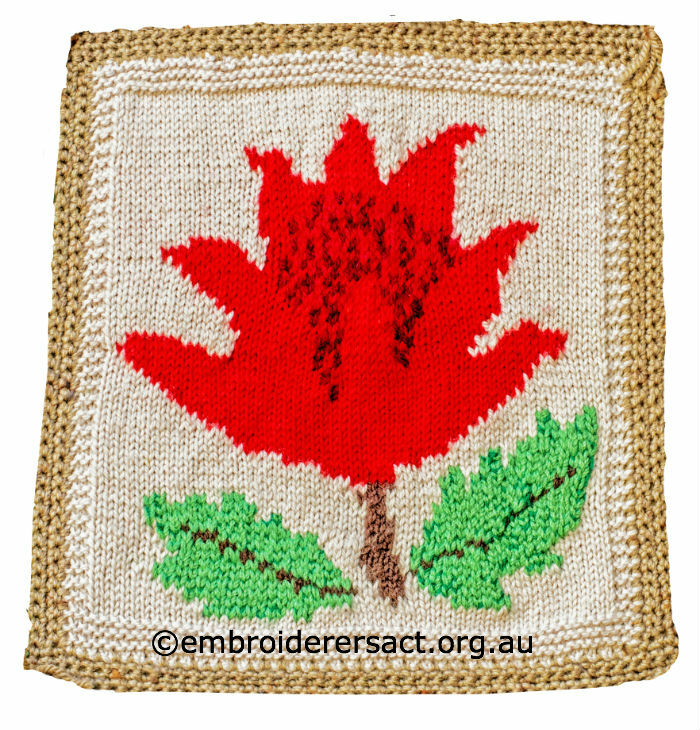 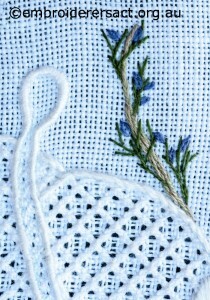 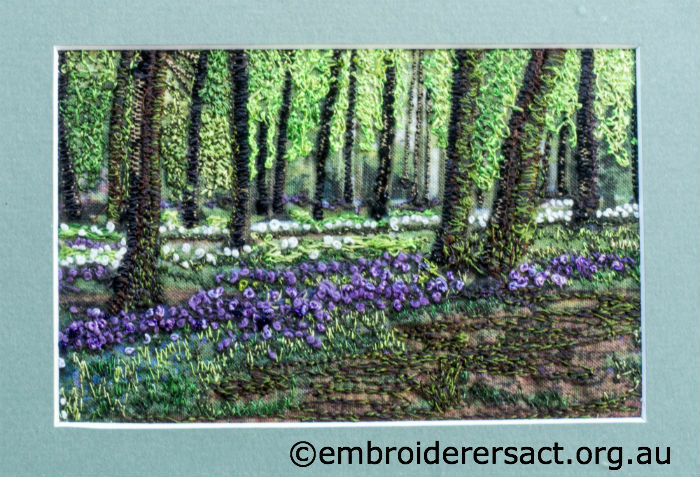 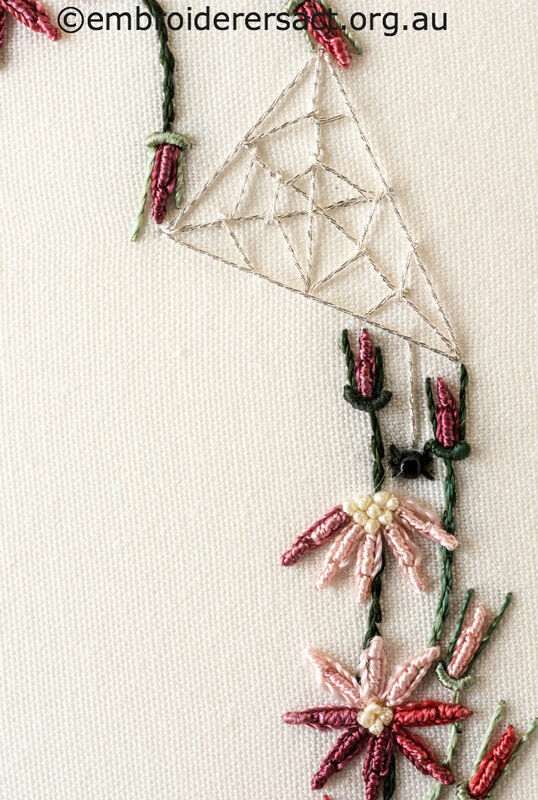 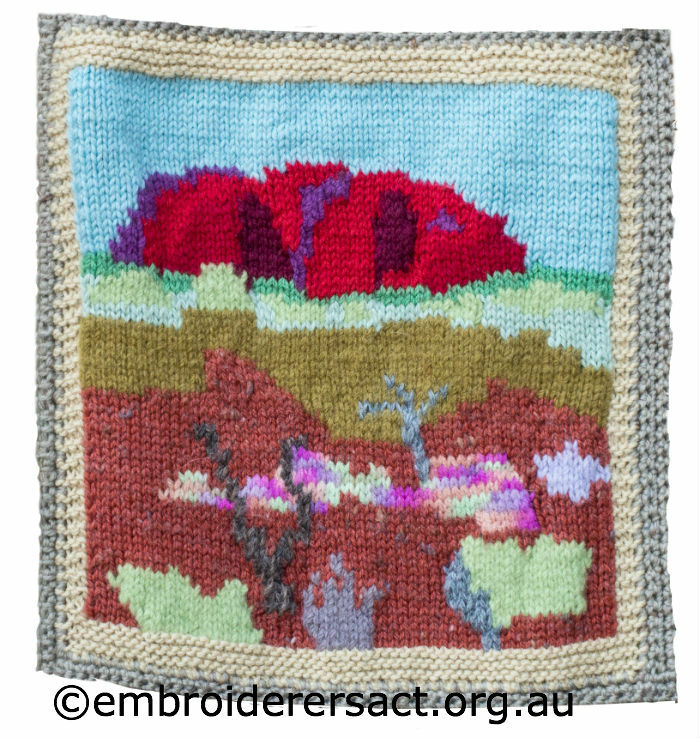 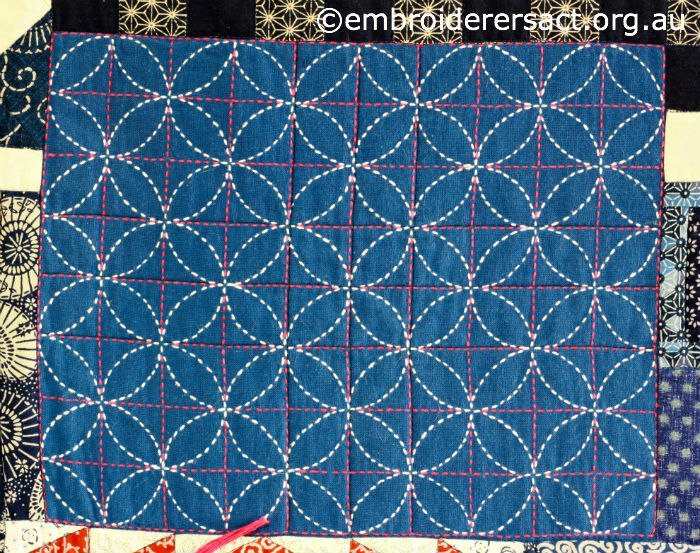 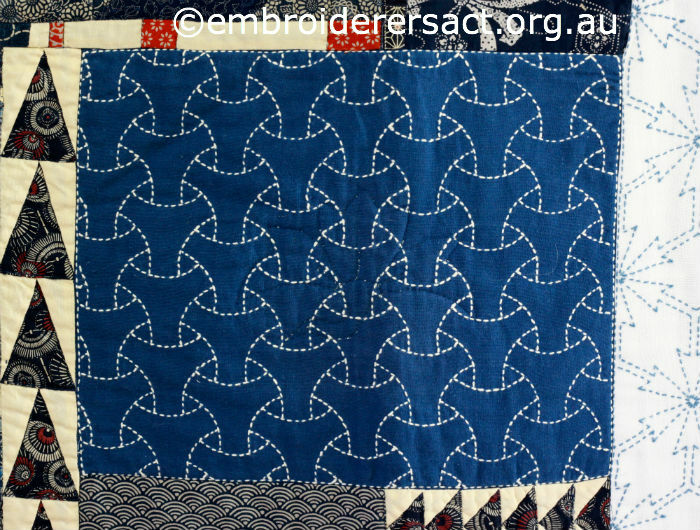 This post features a beautiful piece of Brazilian embroidery stitched by Sharon Burrell. 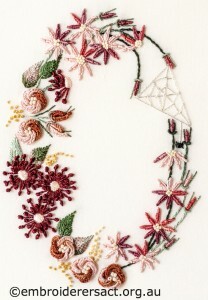 The design is by Delma Moore for Blackberry Lane and is called Shades of Autumn. 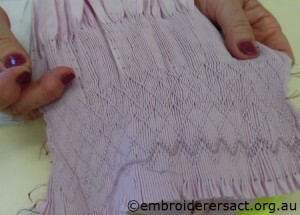 This technique is characterised by the use of rayon threads which have a sheen and a special z twist to them. 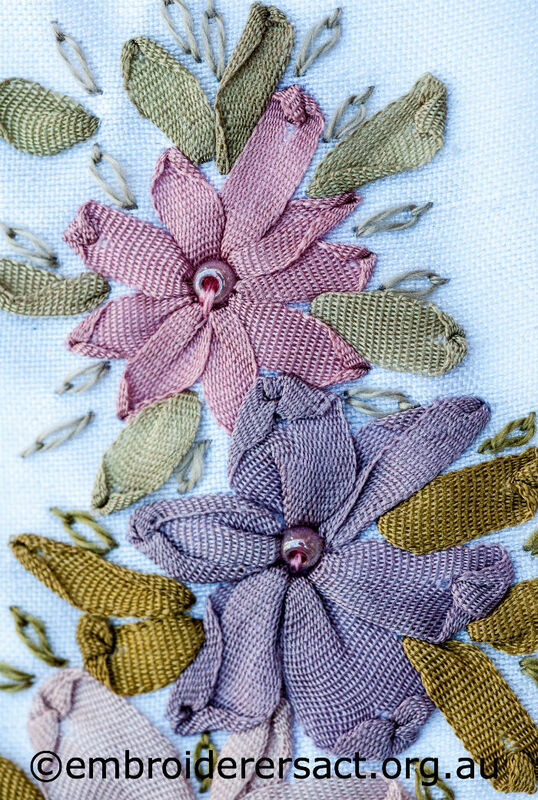 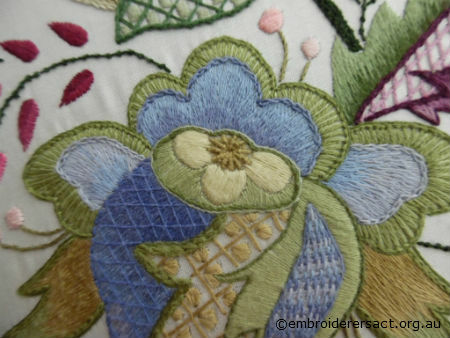 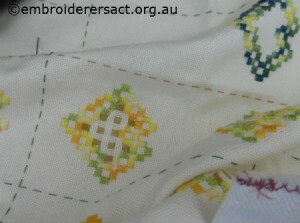 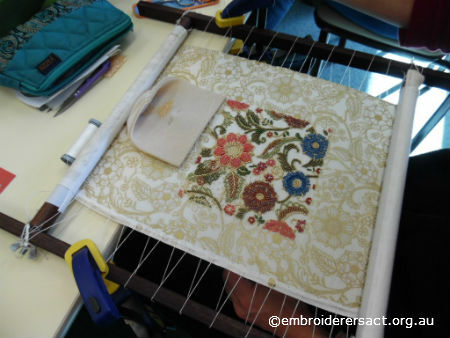 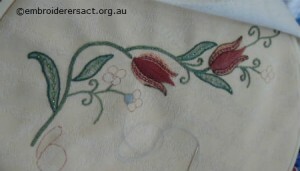 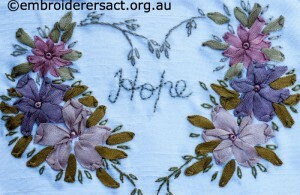 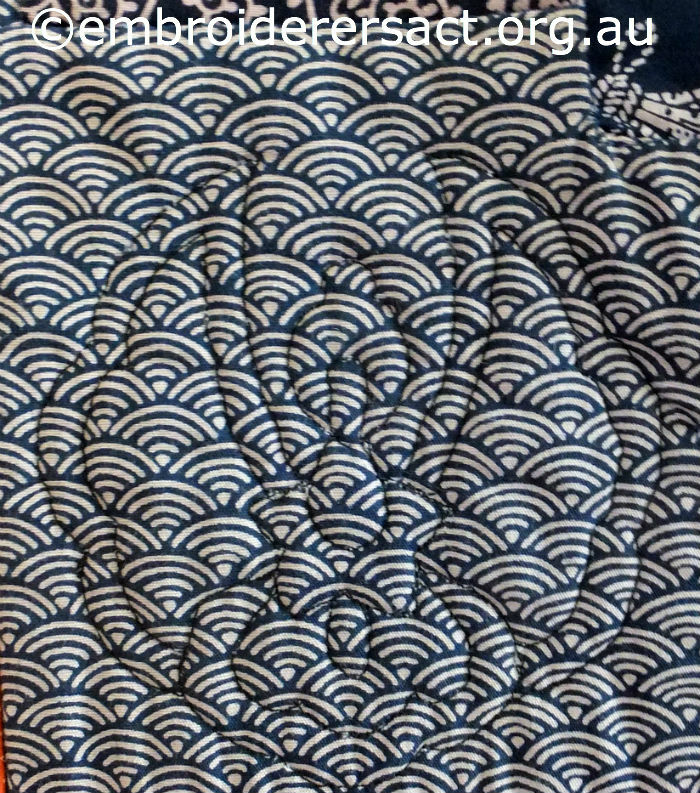 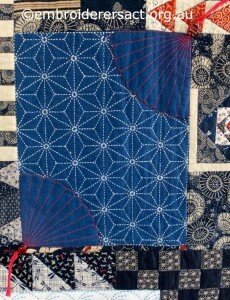 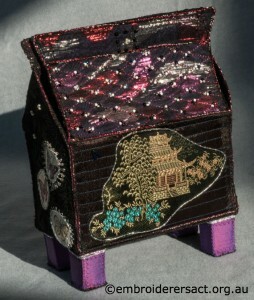 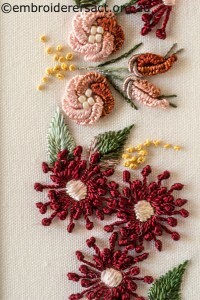 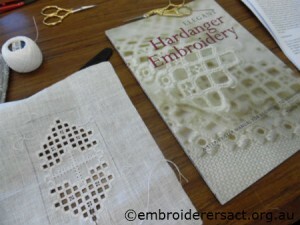 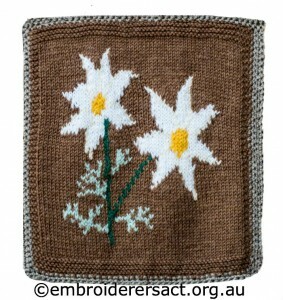 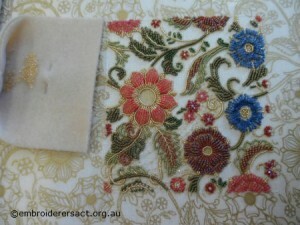 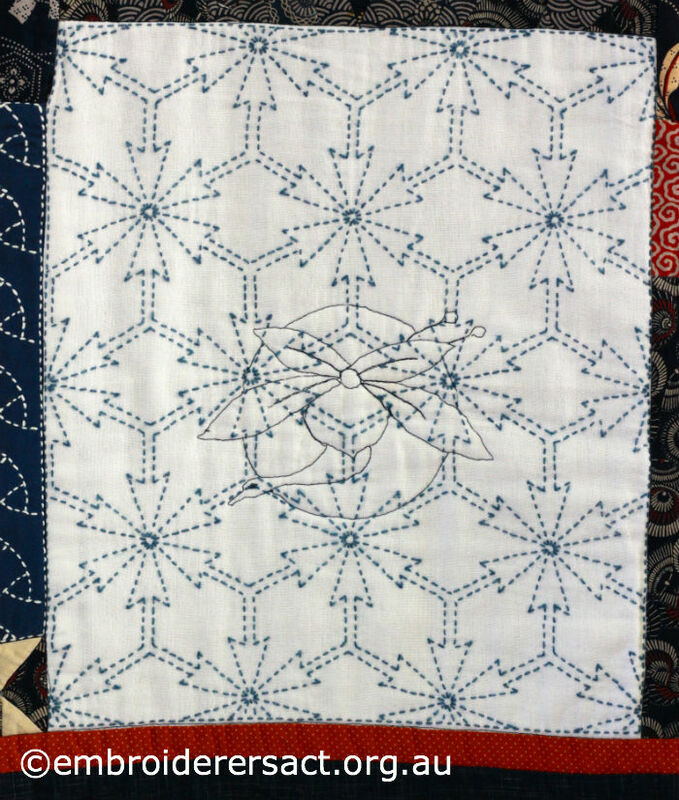 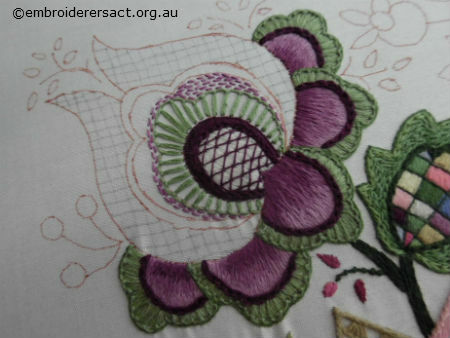 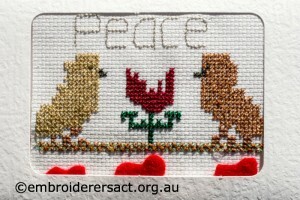 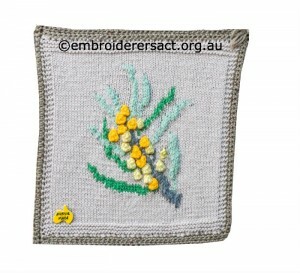 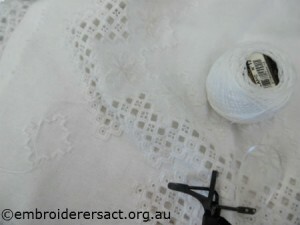 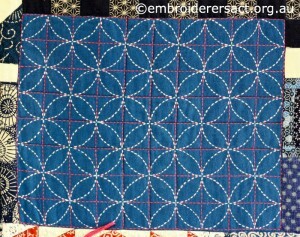 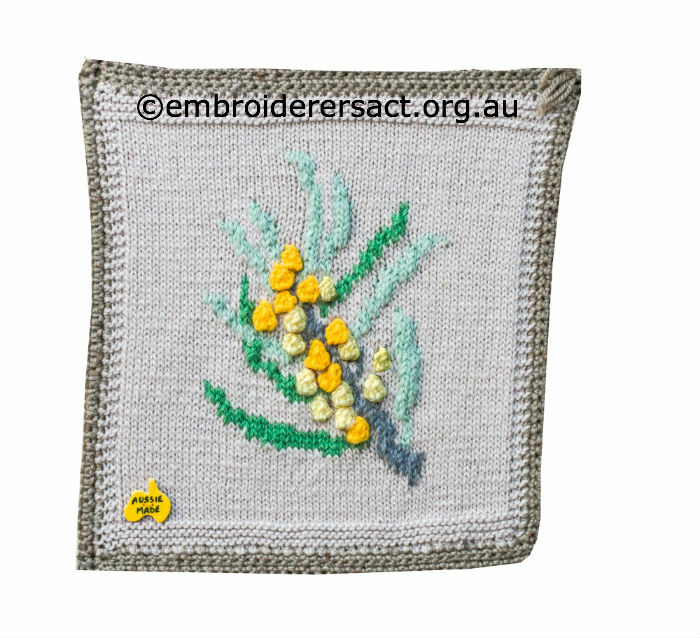 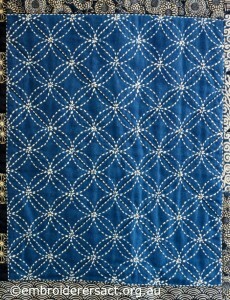 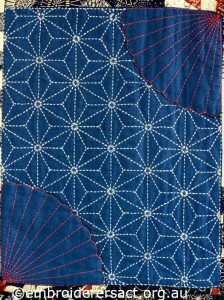 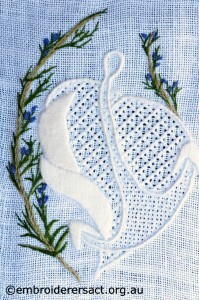 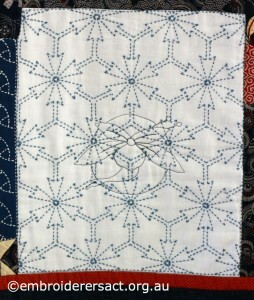 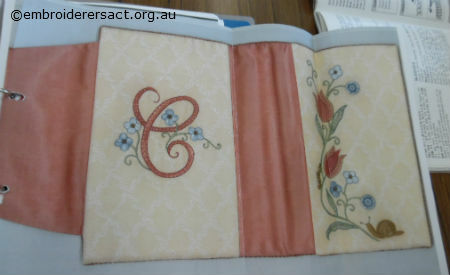 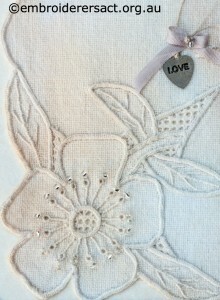 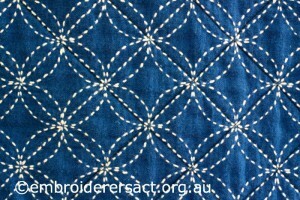 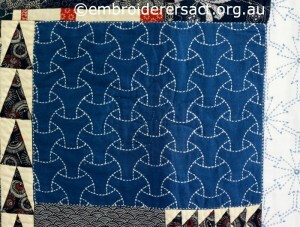 While the motifs are usually flowers the stitches used create a very textured and dimensional surface. 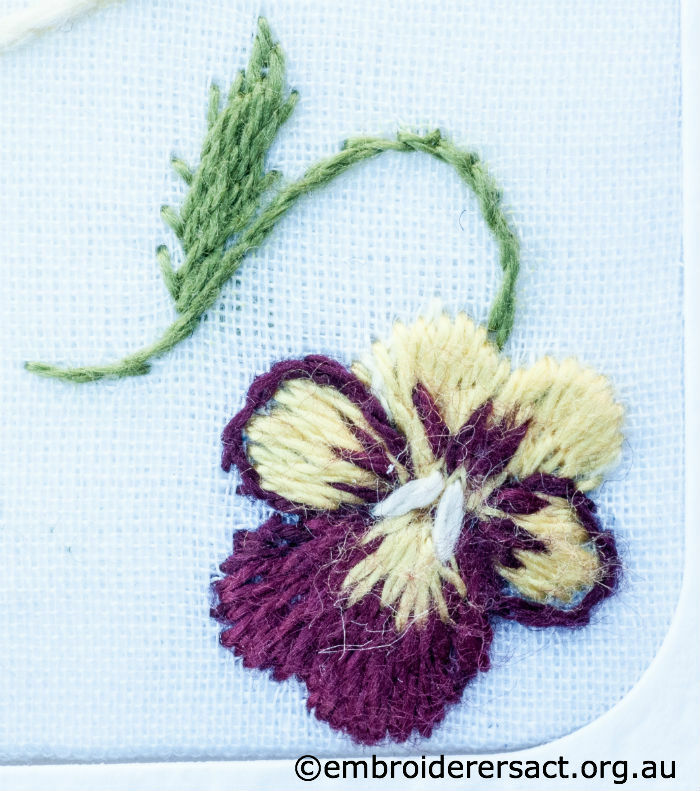 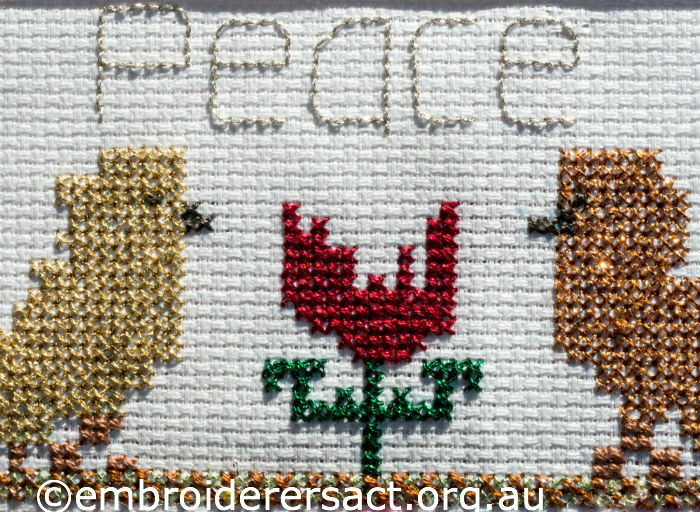 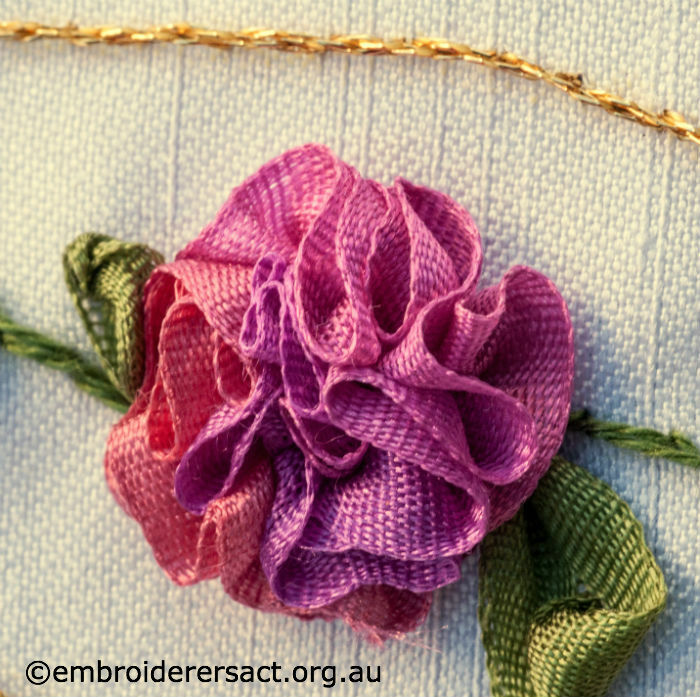 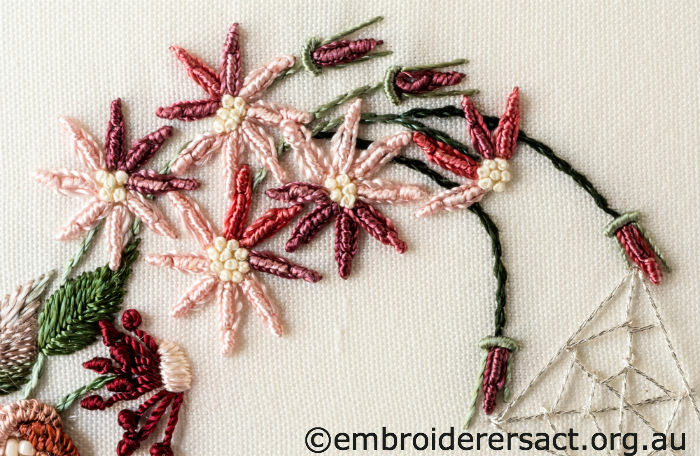 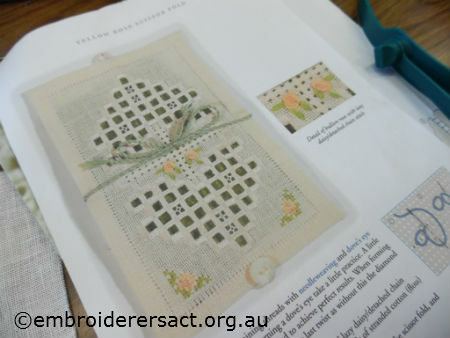 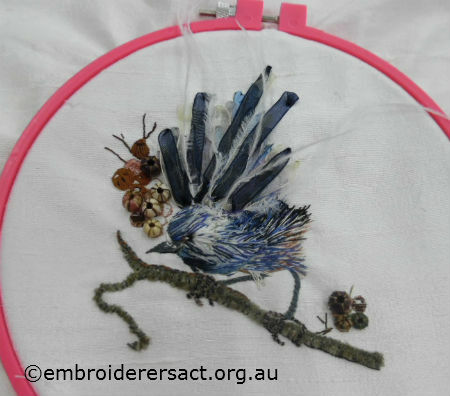 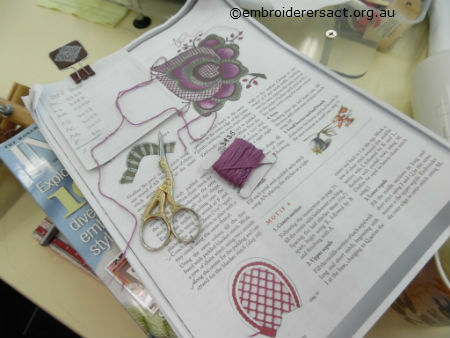 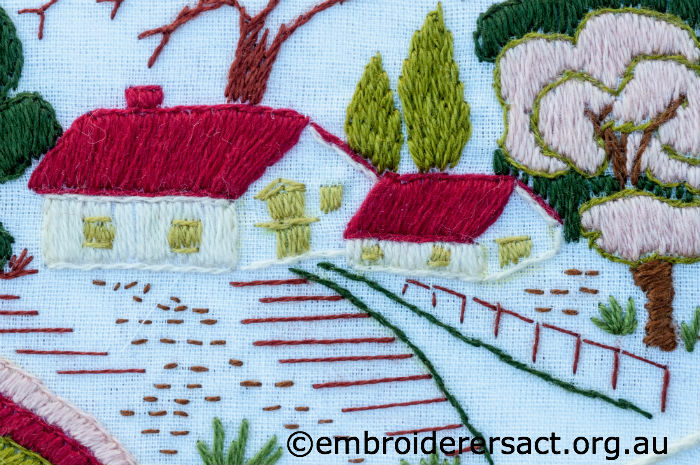 If you love doing Bullion Knots, French Knots, Cast-on Stitch and Drizzle Stitch then you’ll love doing Brazilian embroidery. I can’t say that Bullion Knots are my favourite stitch but I do find them easier to do with rayon threads – somehow they’re more forgiving and it’s easier to control the tension and shape the knot after you’ve pulled the needle through. The backgrounds which are flatter use stitches like Stem Stitch, Fly Stitch, Fishbone Stitch etc. 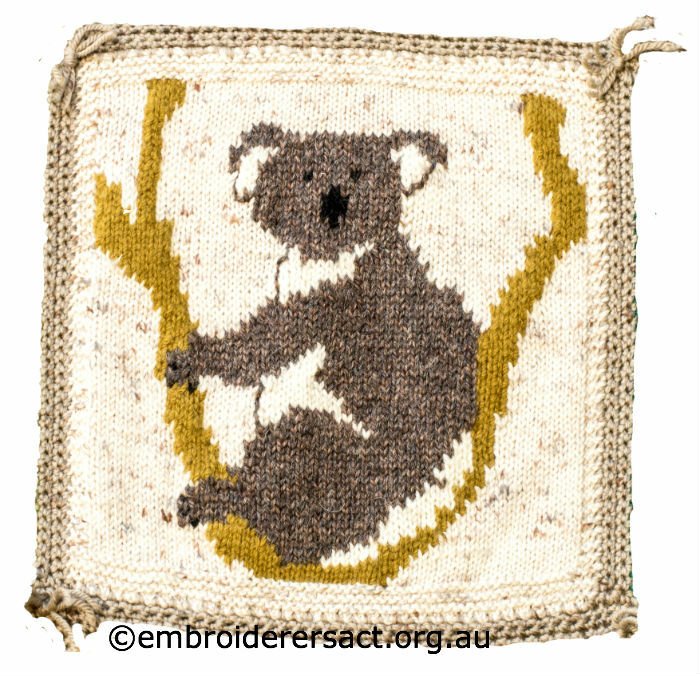 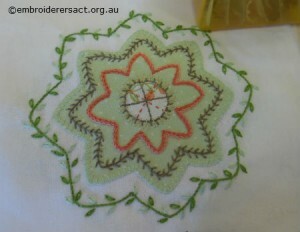 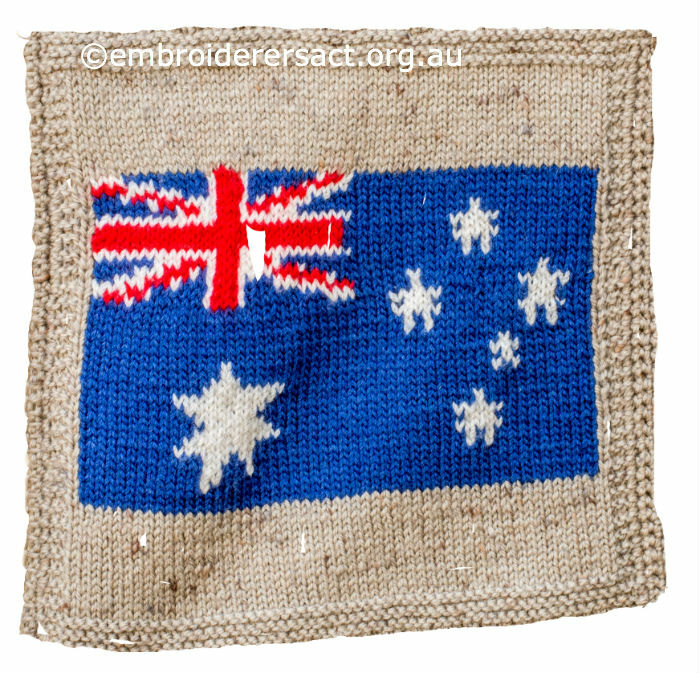 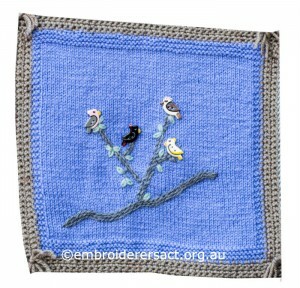 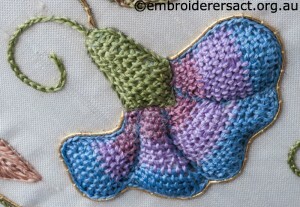 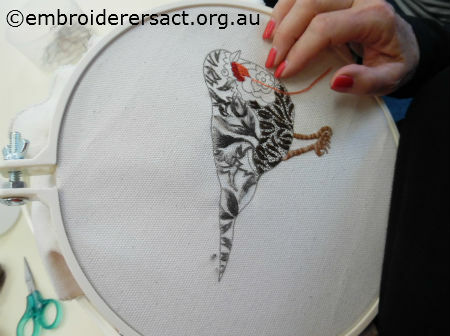 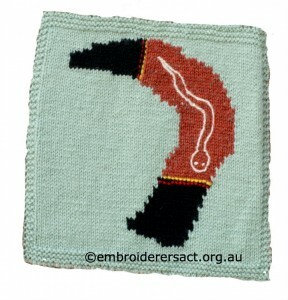 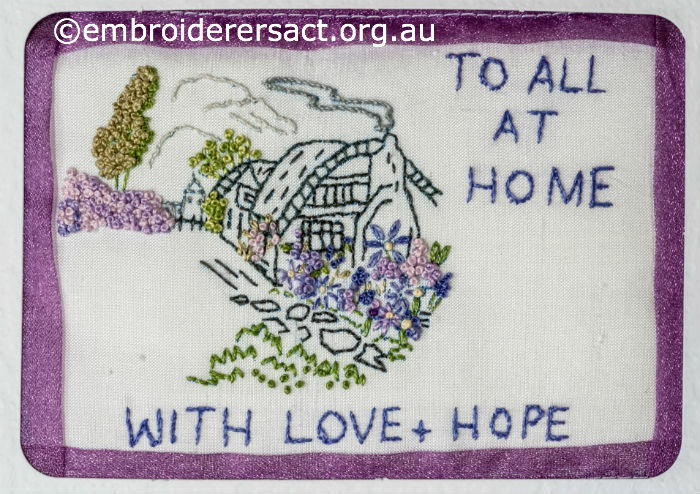 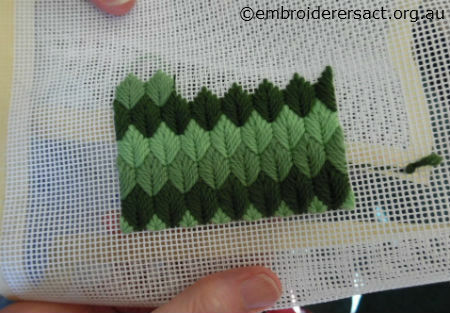 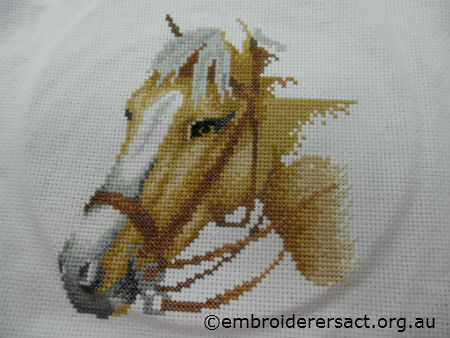 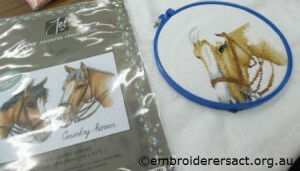 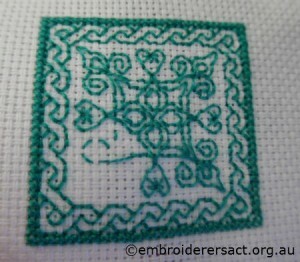 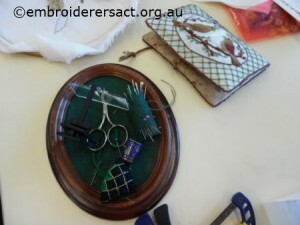 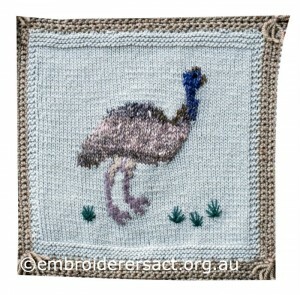 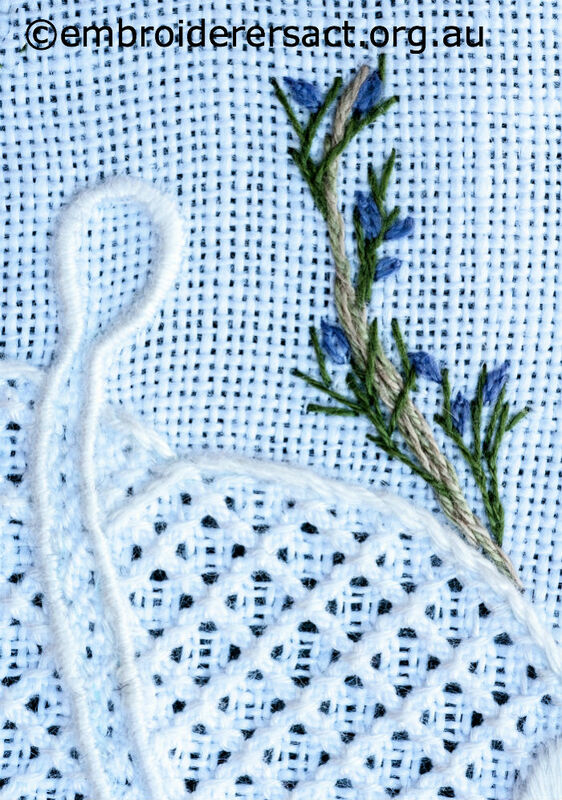 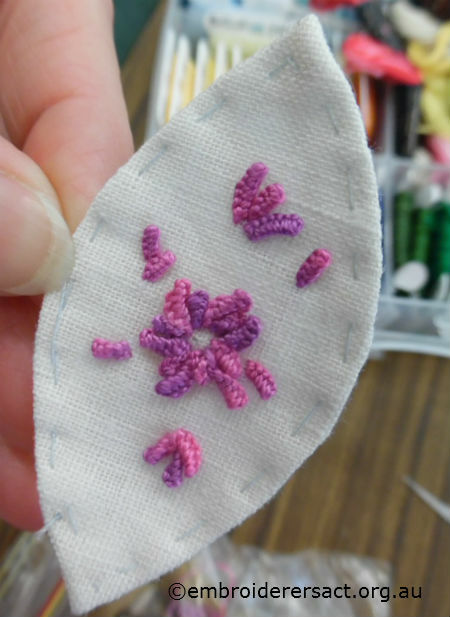 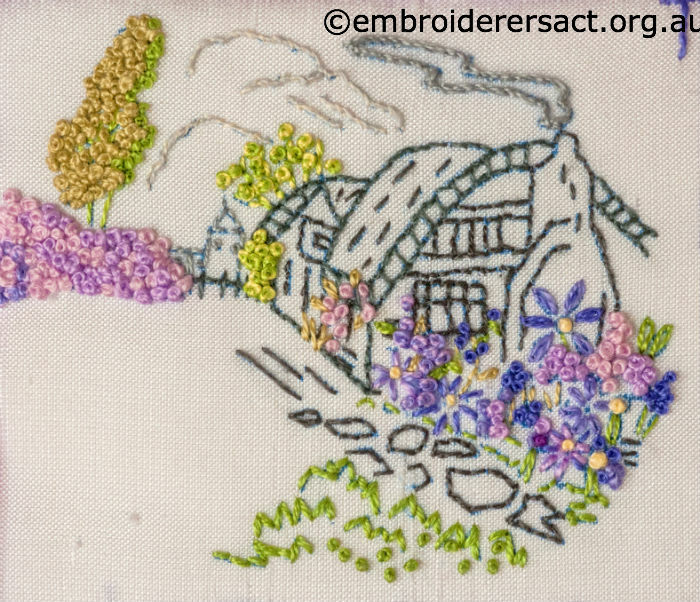 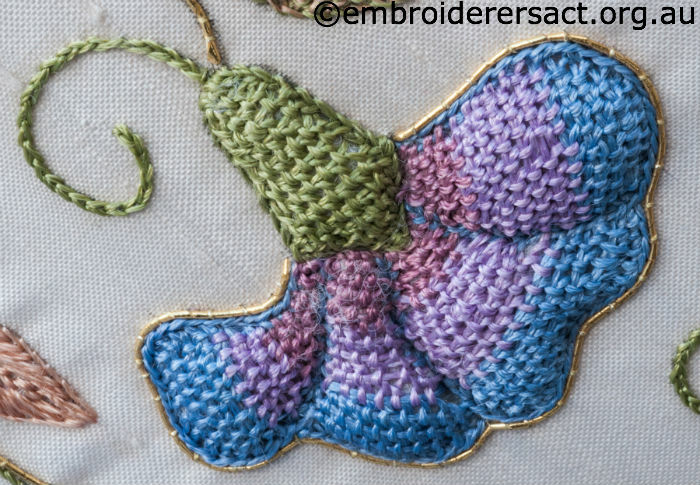 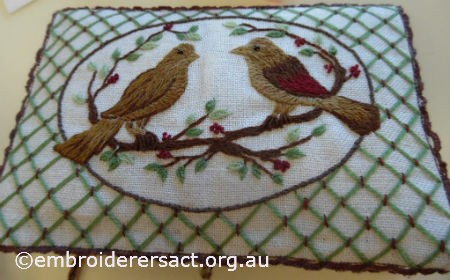 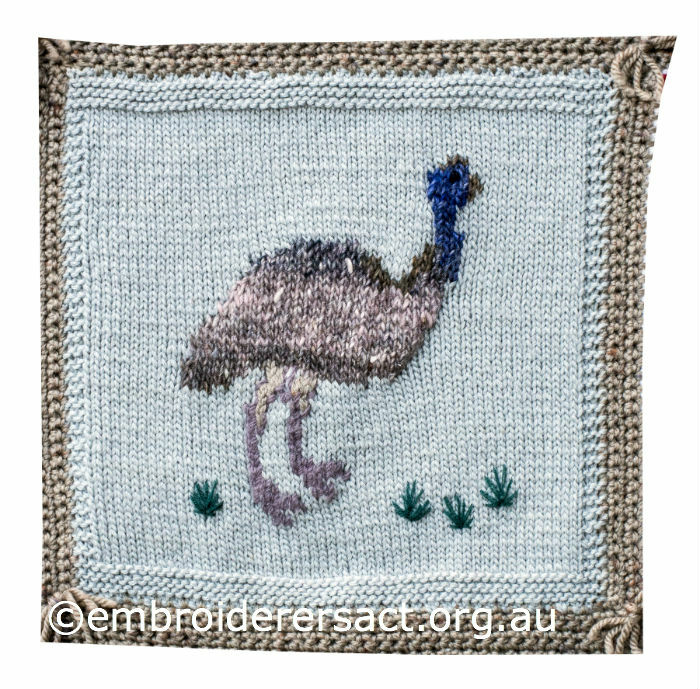 If you’d like to watch videos of how to do these stitches then head over here to Mary Corbet’s website. 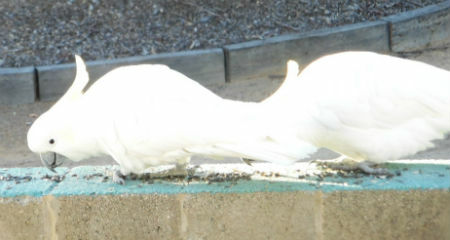 A big thank you Sharon for sharing this beauty and to Stewart (Bath) for the great photos. 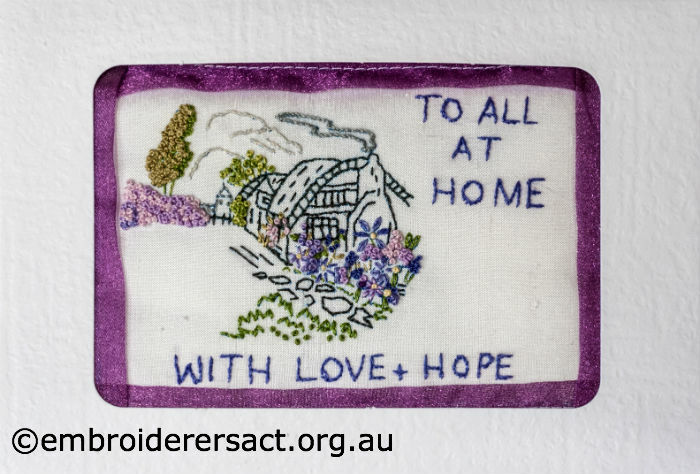 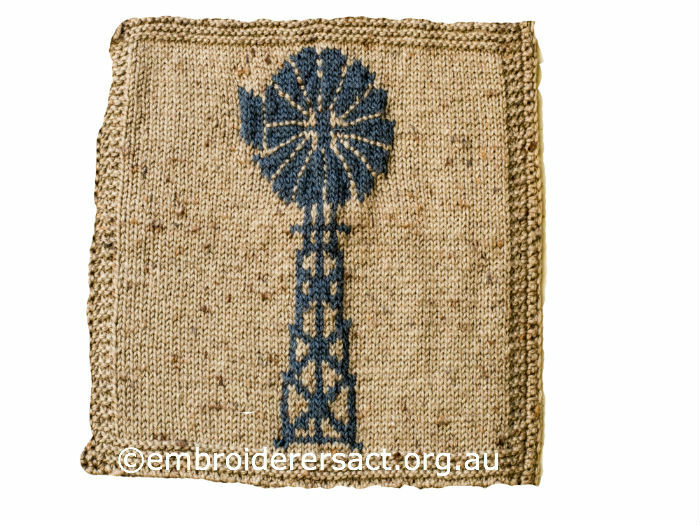 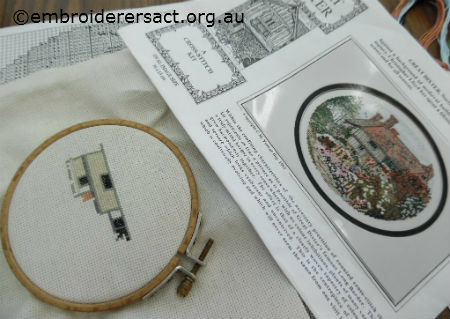 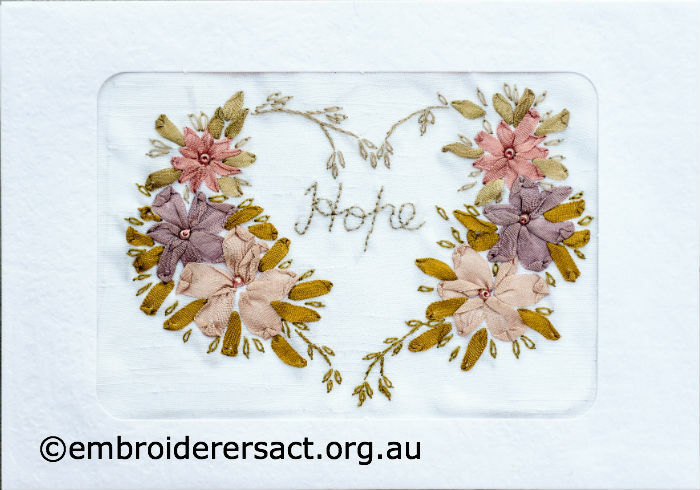 Here’s some more stitchy goodness from our 2014 Creative Challenge where members of the Guild re-interpreted WW1 Silks (postcards). 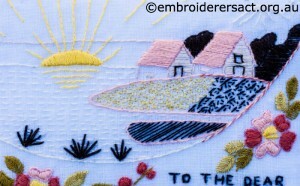 The first has a tranquil, welcoming country scene…..
and here’s the heartsease close up….. This next lovely postcard also evokes ‘home’ but the colours and style give it an oriental feel …..
and Meryl’s fourth postcard is very Australian – an elegant beaded sprig of wattle….. I really like the use of metallic threads and the hearts to give a pop of colour. 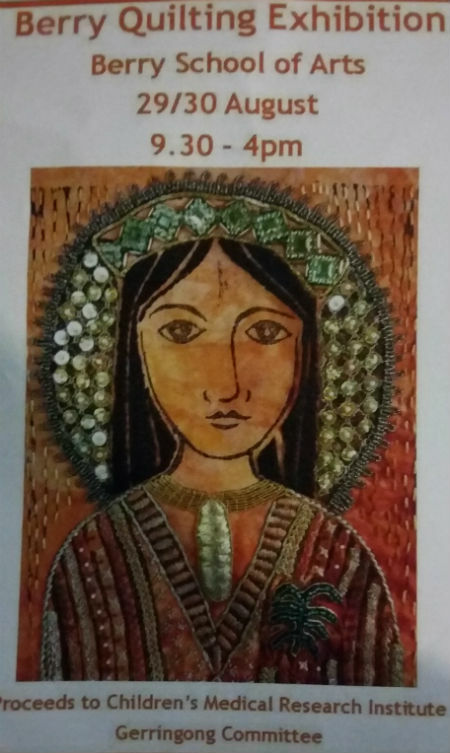 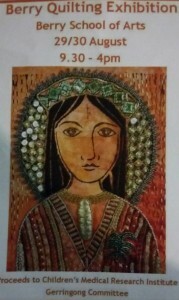 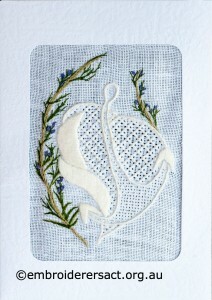 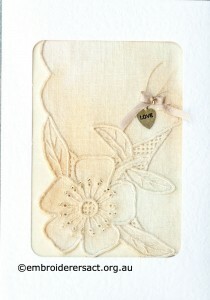 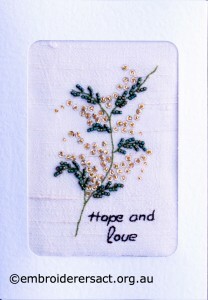 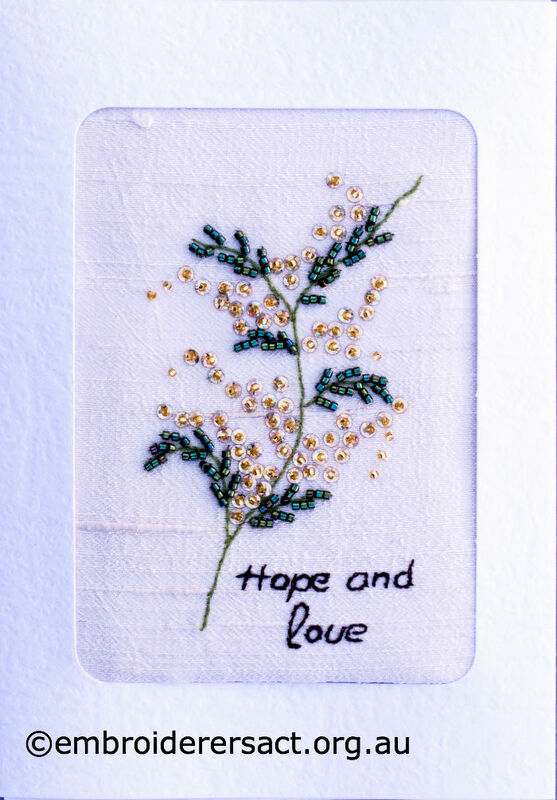 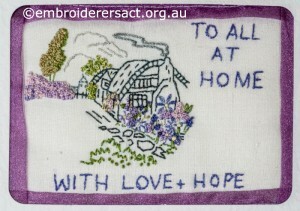 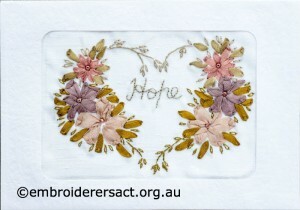 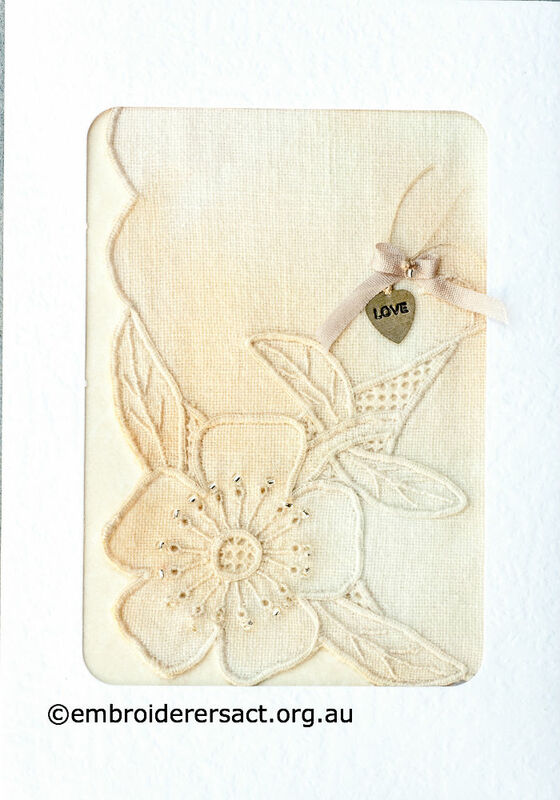 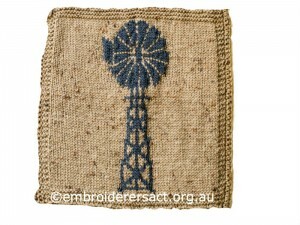 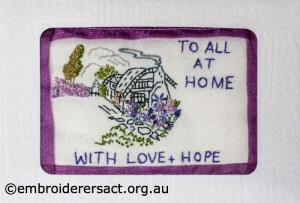 Evelyn has stitched a lovely postcard with a very vintage and delicate feel….. 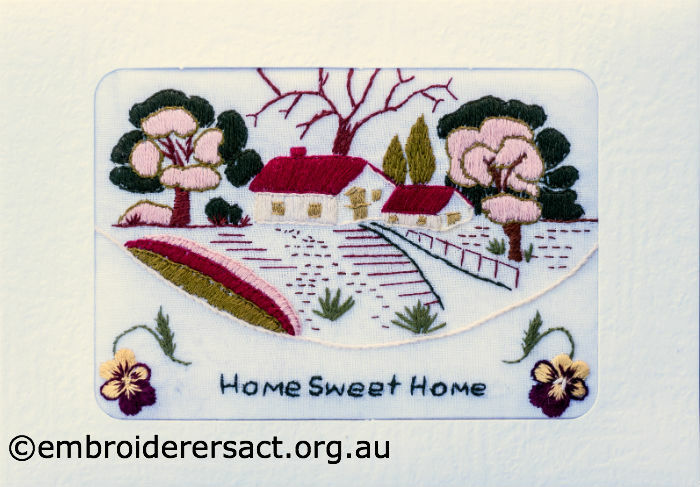 This postcard evokes the warmth and cosiness of a home full of love – I just want to walk through the garden and go in the front door and sit in front of the fire.